PACT secured Heritage Lottery Funding to bring schools from Penrith and the rural areas together on May Day 2011 to celebrate our rich storytelling heritage. There were performances with giant carnival puppets and props. See the Mayday parade photos. 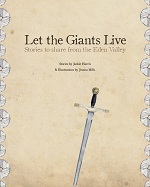 "Let the Giants Live", the book of the project, has been short-listed for the Lakeland Book of the Year 2012. Please get in touch using our contact form or take part in the discussion forum. Click on the Story Giants tag on the left to see what else is online here. Story book Let the Giants Live: Stories to share from the Eden Valley was launched at Penrith Library on 26th November 2011. Copies of the book are being given out for free to participants who completed the feedback questionnaire. Sorry, currently no further books are available unless we do a print re-run. 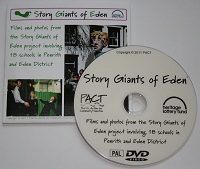 As a follow on project, PACT has produced a DVD of the Story Giants of Eden project. Want to do more or learn from our experience? Project evaluation report now available. If you would like to learn from our experience, copy our project or ask our team to work in your school, please contact us. The lead story teller Dominic Kelly, costume designer and illustrator Jess Mills, and story book author Jackie Harris provide services to work directly with children or training teachers. BlueJam are providing the procession music for the Story Giant puppets at the Penrith 2011 May Day parade. Come and learn easy samba drum patterns at North Lakes School on Thursdays from 7-9pm. £5/£2 per child. No experience needed. More info. Dawn Hurton, Extended Services Adviser, has been working with the Penrith Town Cluster of schools to develop this exciting project. The project will be delivered in partnership with Penrith Action for Community Transition (PACT). An award of £49,000 has been secured from the Heritage Lottery Fund to bring schools from Penrith and the rural areas together on May Day to celebrate the rich storytelling heritage on the streets of the town. There will be performances with giant carnival puppets and props. There is a lot of enthusiasm for the project and the early indications are that a lot of schools will be participating. Schools in the Middle Eden and Rural Penrith have been invited to join in and share the opportunities. As people rely less on memory in today’s high speed instant world, new means of communication are replacing old. Stories never written down but passed through the generations by word of mouth are in danger of being lost. These stories are part of the DNA of our town. This project will help children and young people to discover some of our old legends and to imagine new ones for tomorrow; not simply revive them. This project is about unearthing and sharing local stories; stories which may have survived for thousands of years. Through these stories, children and young people will learn about the people, customs and traditions of their community and how they connect us with the landscape. The Story Giant project will provide opportunities to learn about oral traditions where people remembered stories from a communal folk memory of many generations. They will examine the origins of different kinds of stories, why they were told and what they teach us. There are Viking and Arthurian legends connected to places in and around the Penrith area and of course the stories about ancient sites. There are stories about noble families and their halls, follies and castles and, at Shap, there are tales about the white monks of the abbey. The homes of Guy and Garlic can be found at Trowgill and the luck of the Eden fairy fold is just beyond the outskirts of Penrith. Farming traditions bring dobbies and boggles and stories about cattle and the weather. Yet more stories relate to holy wells, caves, fire or water worship and in the inns there are spirits other than those found behind the bar, apparently even to this day. These stories evoke days when candles flickered in draughty homes and people amused themselves round the fireside talking about witches, devils and ghosts. They bring back an age when rational explanations included fairies and spirits, and when strange prehistoric beliefs such as the “need fire” were thought to cure ailments. Schools will be provided with facilitated opportunities to learn about forgotten myths, legends and the rich human heritage of this area. A leading performance storyteller will help children and young people to delve into the origins of disappearing folklore. Children will gain insight in an age appropriate way into how stories came into being and what they tell us about how people lived long ago. The storyteller will then teach how to tell the strange tales which have fascinated mankind through the ages. Children will explore these and then create stories for the future based on research and inter-generational activities about the past. Taking recent happenings of deep local significance, pupils will imagine how, out of meaningful events, embellishment will happen and stories grow alongside dry written fact. This teaches how to unlock a secret history of Eden through our old tales. A local May Day tall-story telling custom will be re-established as a new event in Penrith. Children and families will draw upon the lives and times of people within living memory to create new place-based legends. Identifying ‘giant spirits’ in each community, participants will develop an exaggerated tale for telling on the streets about how their giant saved the day. To contribute to the spectacle, 4m tall carnival giants and props will create remarkable visual images bringing bones, flesh and life to the giant stories. Passers by will help judge how believable the stories are. Who knows, the Bishop of Carlisle may pass by again and win a prize as he one May Day did at Temple Sowerby. The performances will be captured on video. Although participants will have learnt the skills to tell stories from memory they will also be written for inclusion in a quirky illustrated keepsake of the giant’s tales. A pull-out map will identify the places from where those giants leapt. Finally, there will be an exhibition at the Penrith museum with giant puppets, photodocumentary, stories and giant costumes on display. How will schools use the project? The project will provide structured activities, scheduled to fit as well as possible with the requirements of individual settings. However, because of the high level of participation some flexibility will be required. It is anticipated that schools will engage in different ways and that the focus may differ between settings. In primary schools, the project can be used to enhance learning about the local environment some are already thinking about how they can link activities into humanities. Others may focus more on drama and performance or on literacy and creative writing though throughout the early stages the focus is on oral storytelling which is at the heart of the project. Some schools have already planned to integrate the work across the whole curriculum. In one of the secondary schools the project is being led by the arts and drama department and there may be opportunities for workshops with groups of primary school children to support transition. In the other secondary school the project will run to enhance lunchtime activities in the library. These are early ideas and the project steering group will aim to ensure that all schools are able to make the best use of the opportunities available and that there is maximum added value attached to the project for all participants. Collaborative work across schools will be positively encouraged and the hope is that the project will build on existing networks between schools and strengthen links with the wider community. The project may also contribute towards transition and Extended Services Advisers will support schools in partnering with each other. A small steering group will be established to ensure that the project is widely owned and as successful as possible for all schools. A basic structure for delivery will be offered to all participating schools. However, efforts will be made to ensure that delivery is flexible and appropriate to all settings. Delivery of the carnival skills workshops will be organised to ensure that they build a strong legacy for the cluster. The project will provide opportunities for a group of staff and older pupils to learn new skills. In this way it will enhance local knowledge and expertise. New storytelling, performance, prop, mask and puppet making skills can then be used to enhance future activities in the cluster. This is a half day event to introduce the project. Lead staff and participating pupils should attend. There will be a live storytelling performance of local traditional stories followed by activities to encourage interaction and provide a taster of what is to come and to provide an experience of how local stories become legends and the process by which small stories become tall tales. This will provide staff with insight into the tradition of oral storytelling and to teach skills and techniques to enable staff to contribute fully and to make a good project into a great one. A representative from each participating school will be expected to take part. Workshops – these will be delivered on site at school. Where schools are partnering together the venue will be agreed between schools. Given the long Easter break this year, workshops will start immediately after Christmas to ensure that performances are ready for break up of school on 8th April 2011. This session will teach a toolkit of techniques to play with and show how to adapt, combine and enlarge stories. This session will provide activities designed to ensure that storytellers know the world of the story in all aspects including visual imagery. There will be describing and questioning activities in pairs, directorial games etc. Masks and props will be made as visual aids to help tell the stories on the streets. The arrangements for making these and the story giants have yet to be finalised and will depend on the number of participating schools and the way that people would like to work. Horse+Bamboo theatre company will be supporting delivery of the carnival making workshops. A crash course in performance techniques will be offered to each school. The session will cover facial and bodily expression and movement use of pace, space and audience warmup and then apply these to the story. It will end with a run through of the local story with feedback. In each school groups will perform their piece to the professional storyteller who will give feedback and work with the group on weaknesses or difficulties. They will then perform it again, in the light of the session which will finish with the voice work to help groups make the most of their vocal capabilities in the potentially busy May Day context. This is a half day session for all groups to rehearse in a final run through and refinement. It will finish with tips for warm-up and routines to counter nerves on May Day and allow tellers to make the most of the event and enjoy themselves. Performance and Participation in the May Day parade. Schools will perform their story which will connect with an overarching narrative on the streets of Penrith. They will join together in the parade accompanied by processional musicians. The stories will then be written up with the support of a creative writing practitioner and a commemorative Giants of Eden storybook keepsake will be compiled. 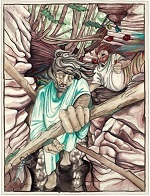 An exhibition of the work will follow at Penrith Museum. How does the project link with Community Partners? Penrith Action for Community Transition very kindly agreed to host the project and will be supporting us as we progress through the activities. Penrith Lions are also keen to support the project and ensure that it is a success on May Day. The project will offer opportunities to involve a range of partners alongside family, friends and the wider school community. Some schools are already working with local history groups, Age Concern, the Civic Trust etc and no doubt there will be other groups and organisations that may be able to contribute to the theme of the work.